Happy Easter to all my friends listening to around the world. I hope everyone had the time to take a day or few off and enjoyed a chocolate Easter bunny or a few chocolate eggs. Well I'm back from a very exciting week of travel and training. I am grateful I was asked to co-facilitate a full day of training on Mentorship in Thailand for the Entrepreneurs Organization. What an amazing experience as I had the pleasure of meeting so many outstanding people. The workshop was full of hand on tools and practical exercises how to be a great mentor! Before we dive into this episode I wanted let you know the Small Business Growth Challenge contest comes to a close on April 6th you only have a few more days so quickly register so you don’t miss out! That’s right one more chance to win a 1 year $2500.00 growth plan for your business. Full details on this offer for Inspiring Greatness Listeners from Silver Lining Ltd on episode 136. Or access the links on our show notes page. 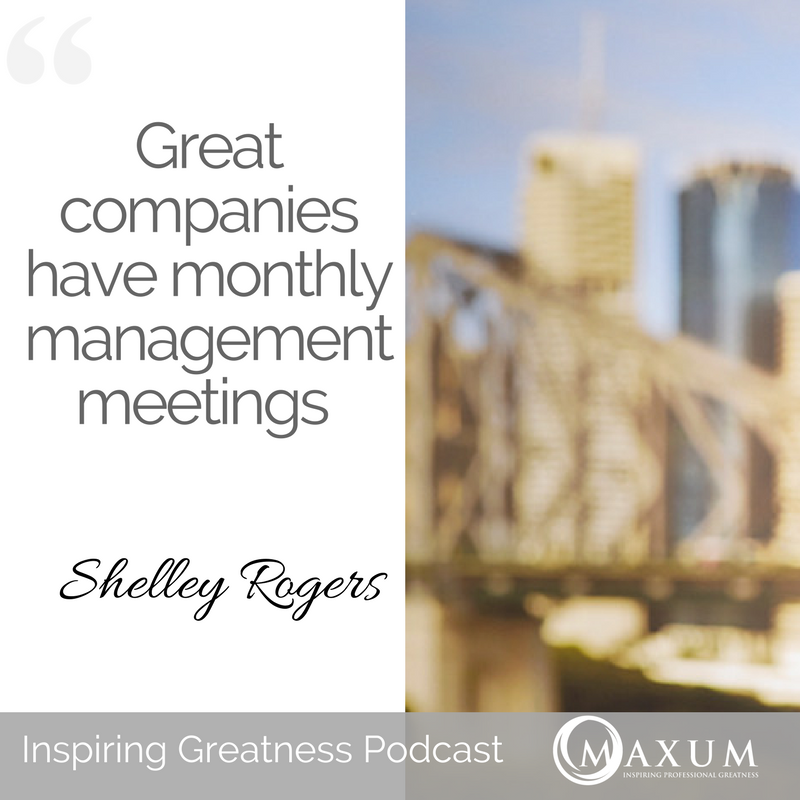 Maxumcorp.com.au/podcast This amazing growth plan will help you gain clarity around your business, understand your ideal client and how to connect with them without spending too much time and money but most importantly, set and hit your financial goals year after year. Its super easy one quick form for a chance to win a 1-year business growth plan, valued at $2500 US. In today’s episode we will provide the content that needs to be covered in the monthly management meeting. You can tell a great company from a good company by spending just a few minutes inside the business. In good companies, you'll find the senior team stressed out and overworked from the crush of ever increasing demands while the rest of the team seems oblivious to the challenges facing the firm. In great companies, you find just the opposite – a senior team rested and relaxed while the balance of the staff is on fire as they work to capitalize on the ever-increasing opportunities facing the business. I may be exaggerating somewhat, but not by much. Unless the DNA of the senior team – namely the knowledge and values required to make good decisions – is sufficiently instilled within the middle managers on down, the top leaders will find themselves increasingly overwhelmed by the demands of a growing business. 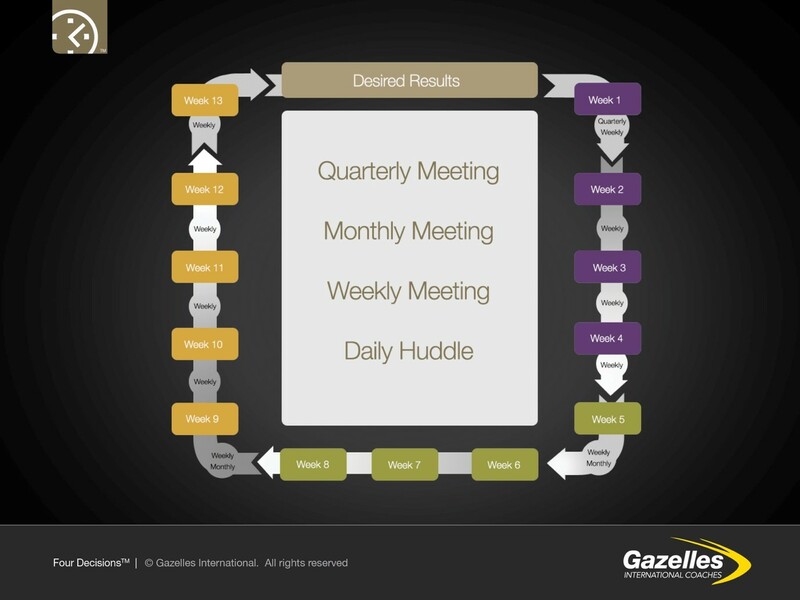 To do this requires one simple routine – a well-structured one-day monthly management meeting that includes everyone who supervises or manages anyone in the business. Focused on learning, sharing, and problem solving vs. a day of mind-numbing reports, anything short of hosting this meeting and the business will ultimately outgrow its middle management. And few things are more painful than seeing a business leave loyal people behind. The Monthly Meeting should be held as soon as possible after the Financial Results are available from your Accounting Department. One of the most important aspects of the Monthly Meeting Cycle is to see how the organization is performing financially – in actuality – against Quarterly Priorities and Metrics. The other primary aspect of the Monthly Meetings Rhythms is to spend some quality time evaluating progress on the Quarterly Priorities – and making decisions on any Corrective Actions that need to be taken, should performance not be tracking with the progress needed to deliver on all Accountabilities to the Plan from each SPA (Single Point of Accountability) – The WHO on the Who, What, When Accountability List. 6:30 – 8:30pm: After a round of good news from the personal and professional fronts, managers share “their number.” In addition, the owners review the mission, vision, and values and update the team on key targets for the year. 8:30pm – ? : Dinner and drinks give the team some important social time. And the personal good news the managers shared earlier fuels a lot of the conversations, creating bonds among the team members. 8am – 10am: All of the managers share their issues from the previous month while the senior team looks for patterns and trends. The main benefit, from the owners’ perspective, is that this session gives the managers a chance to vent and verbalize their challenges. Often, other managers have constructive solutions which are shared later through private conversations. 10:30am – 12:30pm: After a tea break, the team gets two hours of training. 1:30 – 2:00pm: After lunch, two 15-minute “show and tell” presentations are made, giving the managers practice with their presentation skills and the opportunity to share best practices. Important to make sure you have someone summarizing the action items for each meeting. 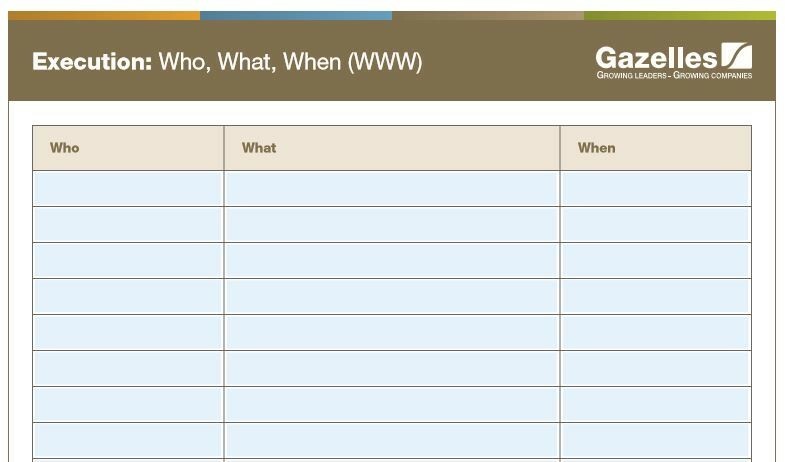 I use a form called WHO WHAT WHEN part of Vern Harnish tools. This form needs to be circulated to everyone in attendance. Hope you enjoyed this episode as much as I did and I’ll be back next week with the final section on annual strategy and the importance of corporate retreats. Averaging 2 days each year, this is where the old plan is assessed, the current realities are tested, and the new plan is formulated.